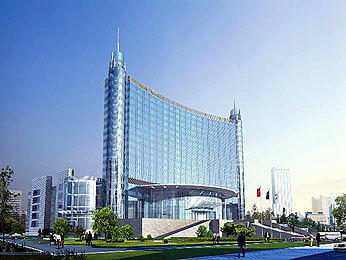 Sofitel Riverside Qingyuan is in the centre of the city, on the banks of the famous Beijiang River. Close to Ying Zhi Cheng Plaza, the hotel is of modern design and features a large lobby area with island reception desk, 368 rooms, 4 restaurants, a lobbybar and executive lounge. Facilities include a fitness centre, 2 swimming pools, a spa, sauna and tennis court. Qingyuan is near the northern tip of the Pearl River Delta, only one hour by road from Guangzhou and the new international airport.